Robert Ray "Bob" Henry. Courtesy of Schlitterbahn Waterparks and Resorts. Image available on the Internet and included in accordance with Title 17 U.S.C. Section 107. The Henry Family - Bob and Billye Henry with their three children, Jeff, Jana, and Gary, ca. 1957. Courtesy of Schlitterbahn Waterparks and Resorts. Image available on the Internet and included in accordance with Title 17 U.S.C. Section 107. HENRY, ROBERT RAY (1927–2016). 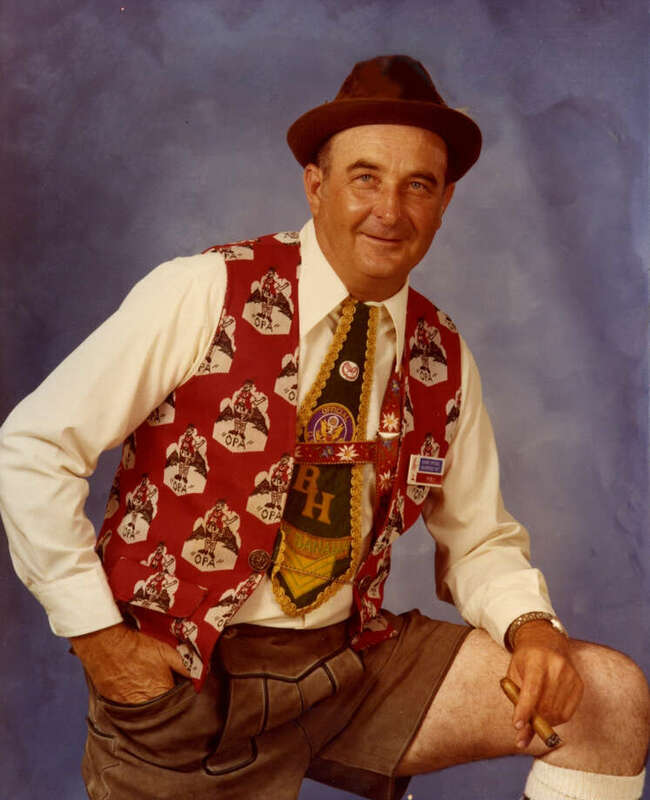 Robert Ray “Bob” Henry, businessman, philanthropist, and founder of Schlitterbahn Waterparks and Resorts, was born on April 23, 1927, in Duncan, Oklahoma. He was the only son of Ray and Irene Henry and was raised in Duncan, where his father worked as a machinist and shop foreman for an oil well cementing company. He graduated from Duncan High School in 1945 and attempted to enlist in the United States Army but was declared ineligible after doctors discovered that he was suffering from hepatitis. After a lengthy convalescence, Henry enrolled at Oklahoma Agricultural and Mechanical College (now Oklahoma State University) where he initially studied engineering but ultimately graduated with a degree in accounting. He was also a member of Lambda Chi Alpha fraternity. While on summer break in 1948, Henry met Billye Jo Drake at a dance in his hometown of Duncan. The two later married on February 26, 1949. After completing his master’s degree in accounting at Oklahoma A&M and receiving his CPA license, Henry went to work for the accounting firm Arthur Andersen in Houston, Texas. Three years later he took a job with Fish Engineering Corporation, an Arthur Andersen client that specialized in oil and gas pipeline construction and associated energy infrastructure projects. In 1958 Fish sent Henry to Panama City, Panama, to open a new office for their subsidiary, Fish International, which at the time was involved in the construction of three major pipelines and a large petrochemical complex in Argentina. One of the first water slides built by Henry at the Landa Resort. Courtesy of Schlitterbahn Waterparks and Resorts. Image available on the Internet and included in accordance with Title 17 U.S.C. Section 107. Another early slide at the Landa Resort. Courtesy of Schlitterbahn Waterparks and Resorts. Image available on the Internet and included in accordance with Title 17 U.S.C. Section 107. The Henrys returned to Houston in 1963 and began looking for opportunities to start a family-run business in a small-town setting. In 1966 they purchased Camp Landa, a thirteen-acre campground with about thirty screened cabins, a spring-fed pool, and recreational facilities on the banks of the Comal River in New Braunfels, Texas. Over the next twelve years, the Henrys purchased adjacent properties to grow and develop the camp, which they renamed Landa Resort. Bob Henry, who had always enjoyed crafting and building things in his spare time, focused on adding numerous capital improvements to the property, while Billye Henry oversaw day-to-day operations and hospitality. They often enlisted their three children—Gary, Jeff, and Jana—to help with new construction projects. By 1977 the property had grown into a forty-acre riverside resort with more than 100 guest units, a second river-fed pool, tennis and basketball courts, a petting zoo, nine-hole golf course, arcade, and café. To capitalize on the resort’s riverside setting, Henry also built his first water slide out of plywood and fiberglass in about 1968, which he later replaced with a sturdier concrete chute that emptied riders directly into the Comal River. In 1977 the Henry family, inspired by a visit to Disney’s River Country theme park at Walt Disney World, decided to open their own family-friendly waterpark. Bob Henry successfully applied for a state permit to widen and dredge the Old Channel Comal River by his property and purchased a building permit from the city of New Braunfels to begin construction of Schlitterbahn (meaning “slippery road” in German). The first installment of the new attraction was a sixty-foot structure modeled after the Bergfried Guard Tower at Solms Castle in Braunfels, Germany. Built to reflect New Braunfels’s German heritage, the tower featured four water slides and a system built to pump water directly from the Comal River. The Henrys also constructed a warehouse to manufacture many of the necessary building materials and oversized ride components on the premises. Aerial View of Schlitterbahn, ca. 1980. Courtesy of Schlitterbahn Waterparks and Resorts. Image available on the Internet and included in accordance with Title 17 U.S.C. Section 107. Riders on the Whitewater Tube Chute, ca. 1982. Courtesy of Schlitterbahn Waterparks and Resorts. Image available on the Internet and included in accordance with Title 17 U.S.C. Section 107. Guests floating through Schlitterbahn on the Comal River. Courtesy of Schlitterbahn Waterparks and Resorts. Image available on the Internet and included in accordance with Title 17 U.S.C. Section 107. Schlitterbahn opened on August 2, 1979, as a seasonal waterpark that operated from April to September of each year. It was immediately popular with visiting tourists, with a first-year attendance of more than 5,000 people. The following year the Hillside Tube Chute–a whitewater inner-tube ride billed as the first of its kind in the United States–debuted alongside a one-million-gallon spring-fed lagoon and a 16,000-square-foot recreation building with an arcade, gift shop, and barbecue restaurant. Subsequent additions to the park included the Cliffhanger Tube Chute (1983), the Tunnel Tube Chute (1984), the Polywog Pond Kiddie Park (1987), the Raging River Tube Chute and Banzai Tube Slides (1988), and a host of other rides, slides, pools, concessions, and recreational facilities. In 1989 the park unveiled a considerable expansion to celebrate its tenth anniversary. New attractions included, among other things, a man-made beach and wave pool, the Congo River Expedition inner-tube ride, and the Der Bahn Speed Slides. That year, the park’s attendance approached nearly 500,000 visitors, making it the most popular seasonal waterpark in the United States. This rapid growth and popularity was attributed to several factors. In contrast to its competitors, Schlitterbahn eschewed the sterile concrete and fiberglass designs of other parks that emphasized short, steep slides. Instead, Henry chose to incorporate his park’s attractions into the natural contours of the surrounding riverfront terrain. In many ways, this simulated and enhanced the experience of floating down the Comal River in rubber inner tubes–a longtime tradition of locals and tourists hoping to escape the oppressive summer heat in Texas. The park also cultivated a laid-back, family-friendly atmosphere that offered free parking, free inner tubes and life jackets, and allowed visitors to bring in their own food. Moreover, the park remained a family-run business, with Bob Henry, Billye Henry, and son Gary directing operations, while daughter Jana managed marketing, merchandising, and retail. Henry’s son Jeff, a largely self-taught engineer, was responsible for designing most of the park’s innovative rides. Jeff Henry later founded Schlitterbahn’s sister company, NBGS International, to supply the family’s park with new rides and features. NBGS International went on to design and build rides for waterparks around the world. While directing the growth of Landa Resort and Schlitterbahn, Bob Henry also contributed to the community of New Braunfels as a prominent booster for the city’s tourism industry. In addition to serving as a board member and president of the Wurstfest Association at a time when the local, German-themed food and music festival was quickly expanding, Henry lobbied for state hotel taxes to be redirected towards the promotion and marketing of local tourism. He also sponsored several local sports teams and employed hundreds of local high school students, who constituted the vast majority of the park’s seasonal staff. In later years, Henry established the Robert Henry Presidential Endowment Fund at Texas State University to award scholarships to Schlitterbahn staff members. Aerial View of Schlitterbahn ca. 1990. Additions to the park can be seen in upper left-hand corner. Courtesy of Schlitterbahn Waterparks and Resorts. Image available on the Internet and included in accordance with Title 17 U.S.C. Section 107. Members of the Henry Family in 2012. From left to right - Jeff, Bob, Billye, Jana, and Gary. Courtesy of Schlitterbahn Waterparks and Resorts. Image available on the Internet and included in accordance with Title 17 U.S.C. Section 107. Bob Henry retired in 1989 and handed control of the business over to his three children. He relocated to Florida, where he purchased a houseboat and expected to live a life of leisure, but he returned to New Braunfels less than one year later to keep tabs on the family business. Under the direction of the Henry children, Schlitterbahn grew from a single park into a family of waterparks and resorts with new locations opened in South Padre Island (2001), Galveston (2006), Kansas City (2009), and Corpus Christi (2015). Additionally, the company’s flagship park in New Braunfels added three new areas in between 1991 and 2011 that featured a number of groundbreaking rides and attractions. By 2015 Schlitterbahn New Braunfels, founded by Henry in 1966, hosted more than 1,000,000 visitors and employed more than 2,000 full-time and seasonal workers. In recognition of his contributions to both the city of New Braunfels and the theme park industry, Bob Henry was inducted into the New Braunfels Chamber of Commerce Hall of Honor in 2003 and the World Waterpark Association Hall of Fame in 2013. Schlitterbahn New Braunfels was also recognized as the world’s best waterpark in the first annual fan poll conducted by Amusement Today in 1998. Since then, it has been consistently recognized as one of the world’s premier parks. Henry died at his home in New Braunfels, Texas, on October 31, 2016, following a prolonged illness. The International Directory of Company Histories (Chicago: St. James Press, 1988–). New Braunfels Herald-Zeitung, May 29, 1980; May 8, 1981; May 22, 1983; January 26, 1984; May 31, 1989; May 23, 1990; November 1, 2016. Joe Nick Patoski, “Wet ‘n’ Wacky,” Texas Monthly, August 1991. Schlitterbahn website (www.schlitterbahn.com), accessed June 21, 2017. Loren Steffy, "Lucrative When Wet," Texas Monthly, April 2015. Handbook of Texas Online, R. Matt Abigail, "HENRY, ROBERT RAY ," accessed April 19, 2019, http://www.tshaonline.org/handbook/online/articles/fhenr. Uploaded on June 27, 2017. Modified on July 6, 2017. Published by the Texas State Historical Association.